In order to understand how L. sibirica will respond to increasing temperatures and CO2 concentration, we are determining how L. sibirica has responded over the last century by analyzing the carbon and oxygen isotope ratios of tree rings. Measurement of the 13C/12C ratio (δ13C) of plant cellulose serves as a proxy for integrated plant WUE (water use efficiency). As the potential for tree water loss increases, more of the heavy isotope of 18O is concentrated in leaf water and the resulting 18O/16O ratio (δ18O is incorporated into plant tissue). By analyzing both δ13C and δ18O in tree-ring cellulose of L. sibirica we can reconstruct a measure of changes in carbon and water balance as temperature and CO2 have changed over the last century. We are using precipitation and atmospheric water vapor samplers to collect water, as well as sampling tree stem water for isotope analyses. After five years, we plan to core old-growth L. sibirica trees, and with the environmental data, calibrate the tree ring δ13C and δ18O. This calibration will allow us to interpret the isotope measurements from tree ring cores for the previous 95 years and reconstruct plant responses to environmental change over the past century. 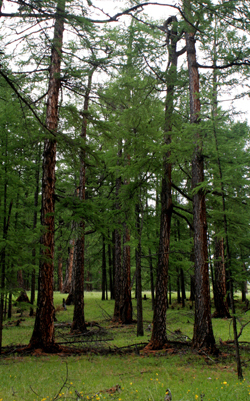 This work is important because current evidence suggests that over the last century Siberian larch forests have decreased transpiration while data from Mongolia suggests an increase in evapotranspiration. Is this discrepancy due to an increase in surface evaporation compared to plant transpiration in Mongolia, or are the larch forests in Mongolia responding differently to increased temperatures and CO2 concentration than those in northern Siberia? The answers are vital as more than half of the precipitation that falls on mid-continental Asian larch forests is recycled from the land surface; any long-term alteration of evaporative flux from the surface could have long-term feedbacks on regional precipitation and ultimately ecosystem sustainability.